My first stop is ALWAYS Fletcher's Corny Dogs! Fletcher's has been around for 75 years and they're the best! Do not buy a corn dog from just anyone. I repeat: do not. The biggest Fletcher's stand is right in front of Big Tex. 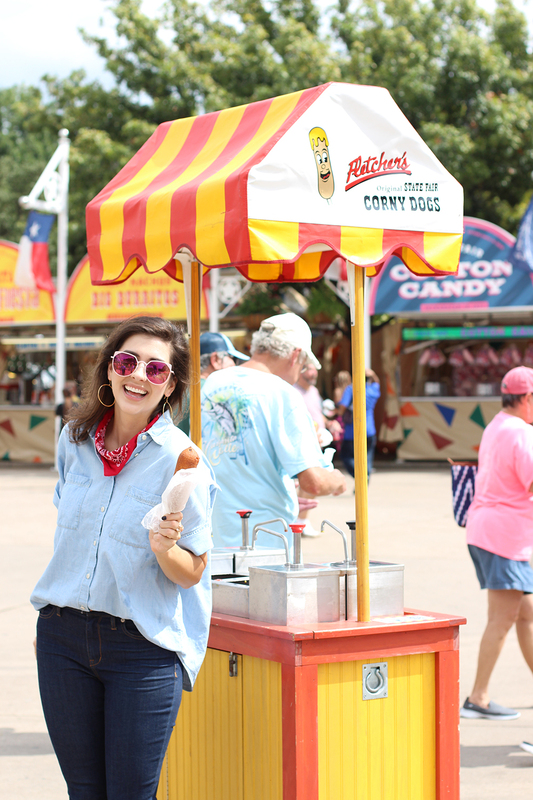 Grab your dog and snap a few selfies with Tex before taking a seat at Big Tex's feet to feast! Don't forget to grab a few napkins and maybe put one in your bag for later. As soon as my friend Jordan and I left Big Tex to walk around, a bird pooped on her (thank goodness we had one napkin)! We didn't walk under any trees the rest of the day ;) After saying hi to Big Tex, the world is your oyster! There are plenty of foods to try, games to play, and places to sit and rest! If you're looking for some fun free activities at the fair, don't miss my favorite- the PIG RACES!! The cutest thing ever...watch little piggies run around and cheer for your favorite to win! After your corn dog, take a stroll down Midway- fair booth central! If you want to play any games you'll have to purchase a game card, available at stands in the Midway; I'm usually not a big gamer, so I walk through Midway to browse any interesting food options and make my way to the Texas Star (the ferris wheel!). 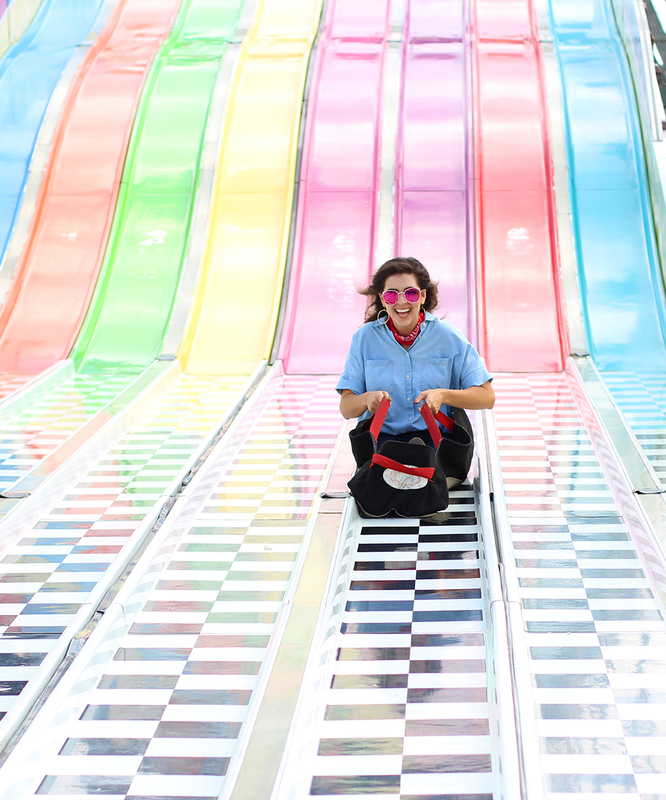 On this fair visit, I rode this slide because it looked like a good time and it wasn't as scary as I thought it would be (I'm a total wimp!). I like to spread out my food purchases with games or rides in between, so I don't go into a fried food coma (happened last year). I'm visiting the fair 3 times this year (told you I'm a fan! 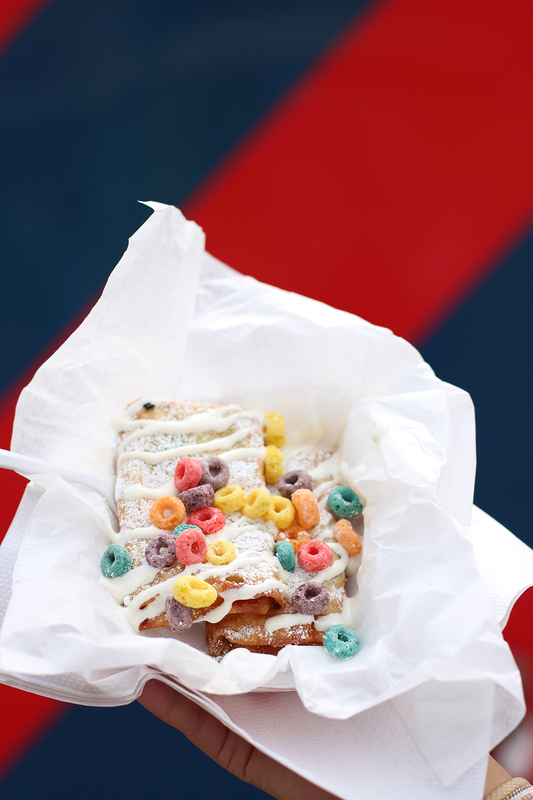 ), so I'm pacing myself on the fried food; this visit, I decided to try the Fried Fruit Loops because they were a top 10 finalist in the Big Tex Choice Awards! I wasn't disappointed, y'all! The actual loops and sugary glaze filling are wrapped in a pastry shell then deep fried, so it tasted like a funnel cake with some fruity flavor. We ate it all. On my next visit, I'm planning to try the Funnel Cake Bacon Queso Burger (Stephen will want to try that one! )- it won both the "Best Taste- Savory" and the "Most Creative" awards this year! Don't forget to visit BigTex.com to see all of the finalists and winners of the Big Tex Choice Awards. 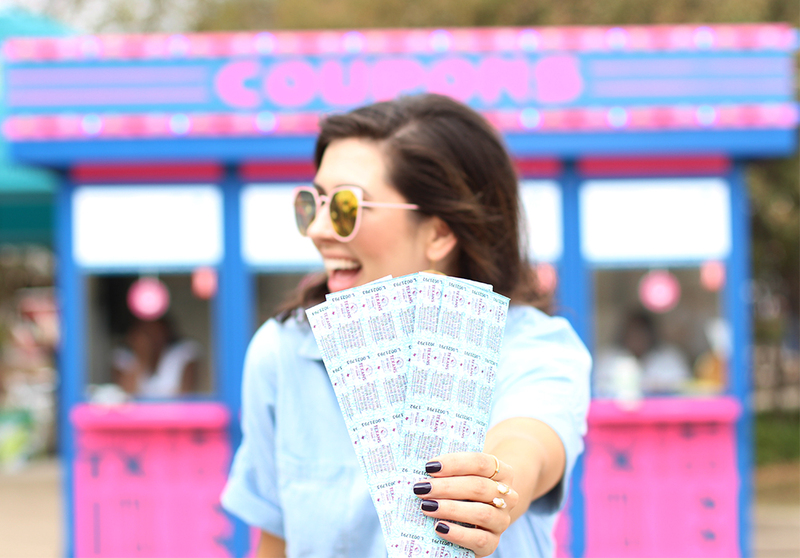 Be sure to pick up a fair "program" when you arrive, so you have a map of Fair Park, special coupon deals and listings of all food and attractions in the park. I was able to visit the fair during the day on a weekday this year and I highly recommend going on a weekday if you can! Lines on the weekend and crowds can get out of control! If you can last all day at the fair, try to catch the parade at night and ride the ferris wheel at night to see all of the Dallas lights! Have fun, fair-goers!